Rabbit Hayes is in the last stages of cancer and the story begins with her feisty, belligerent mother Molly taking her to the hospice. The story is told through Rabbit’s memories and takes us through her awkward teens, blossoming through her love for Johnny Faye and becoming a mother to her beloved Juliet. The whole collection of Rabbit’s family and friends also has a voice and together they create a lively and chaotic background to her final few days. I refuse to say any more other than the whole cast jump of the page and all of them are wonderful. I loved, loved, LOVED this book. 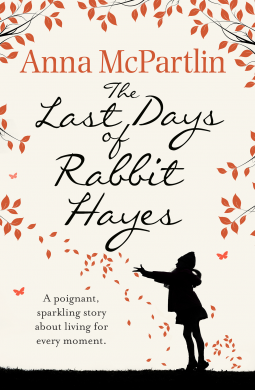 I held back from reading it for a while as the subject matter was very close to recent personal events, and yes I did sob, but Anna McPartlin has created a touching, sensitive and downright funny novel that celebrates family, love and grief. Beautifully crafted, moving and a must read. Thank you to the publishers and netgalley for my copy of this book.